This intensive Action Research Program takes place in São Paulo from 21-24 February 2018. It engages a curatorial perspective on how to conceptualise artworks, evoke critical thinking and contextualise creative practices. A utopian sense of time and space has characterised São Paulo’s rapid vertical and horizontal development up through the twentieth century, becoming capital of commerce and power and hosting a boom in artistic and cultural expressions. The rapid development governed by public politics and furthered by technological optimism however reveals its fragility in environments of hostility, oppression, speculation and growing inequality. In this urban context, a ‘vivid’ spirit of speed, intensity, brightness, volume and accuracy characterises a time-space condition infusing both society and the arts – even despite the ban on visual advertisement in the city centre. Both visible and invisible sensible vibrations created by humans and machines channel through urban systems and human-machine interfaces, affecting the human nervous system while bypassing consciousness. Occupying a speeding, relative logic of time-space these sensibilities translate via algorithmic logic and codified human behaviour into innovations and visions – fuelling utopias of desire, growth and speculation. The same vivid spirit has infused the media arts with intense, sparking, animated, exciting, dynamic, shocking, and vibrant energies amounting in artists’ expressions with for example urban video projection and mapping, light scenarios, audio-visual performance, and sense-intense immersive environments. In the domain of the arts however, we find different modes of space-time occupation, for example when art “stretches” or “shortens” our experience of time, makes visible invisible temporalities in our world that we sense but may not normally ‘see’, or when the art introduces other time-space experiences that reflect other cultures, societies or contemporaneities. Such alternative felt situations might evoke and even generate utopias that are different, rooted in different social realities in the city and peaking towards alternative visions of the future. The question is: What can urban media art do as a mean of intervention among contradictory utopias of São Paulo? What are the space-time experiences offered in São Paulo? How do they affect human thinking, habits and agency? What could be alternative space-time experiences, as found in legacies of indigenous cultures or spiritual beliefs – some which are archived in hidden histories and cultures? How can artistic expressions offer different temporal-spatial experiences? What aesthetic tactics, idioms and forms may the art engage to offer different feelings of presence? What is the value in aesthetics that challenge or amplify our experience of presence, of ‘being here now’; that challenge the protocols for perceptual experience that are laid out for us by society? Video by Giovanni Manzi, Marcelo Machado, Mariana Leão, Matheus Domingues, and Nicolas Toniollo. Tanya Toft Ag, Daniela Arriado, Marco Artigas, Lucas Bambozzi, Giselle Beiguelman, Arthur Cordeiro, Rodrigo Gontijo, Nathalia Lavigne, Patrícia Moran, Marília Pasculli, Didiana Prata, Demetrio Portugal, Fernando Velázquez, VJ Spetto (United VJs). 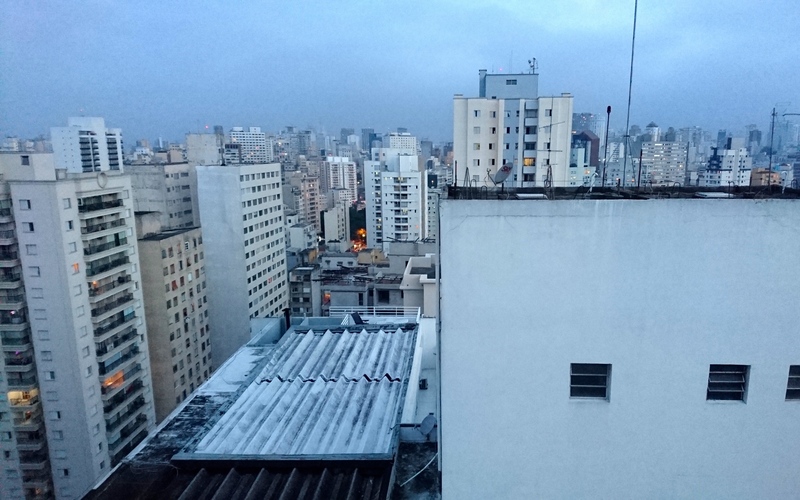 The program invites artists, curators, architects, VJs, filmmakers, musicians, students, theorists and others with interest in media art to examine curatorial perspectives on urban media art in the context of São Paulo. Participants will receive a certificate issued by the Urban Media Art Academy upon completion of the program. The program is free for participation and open access, but please register/apply for certificate and access to future programs. Registration is open until 16 February, or until full (20 participants). Confirmation on registered participation by 17 February. 100-word short statement: What do you think urban media art can do for São Paulo today? The UMAA São Paulo | Feb 2018 program is co-organised with Verve Cultural and AVXLab. It is realised in collaboration with Goethe-Institut São Paulo, University of São Paulo and FAU – Architecture and Urbanism College, Centro Universitário Maria Antonia, OUTROS Laboratória para Outros Urbanismos, Da Haus, Red Bull Station, Screen City Biennial, and Connecting Cities; and co-funded by Danish Arts Foundation and OCA – Office for Contemporary Art Norway.